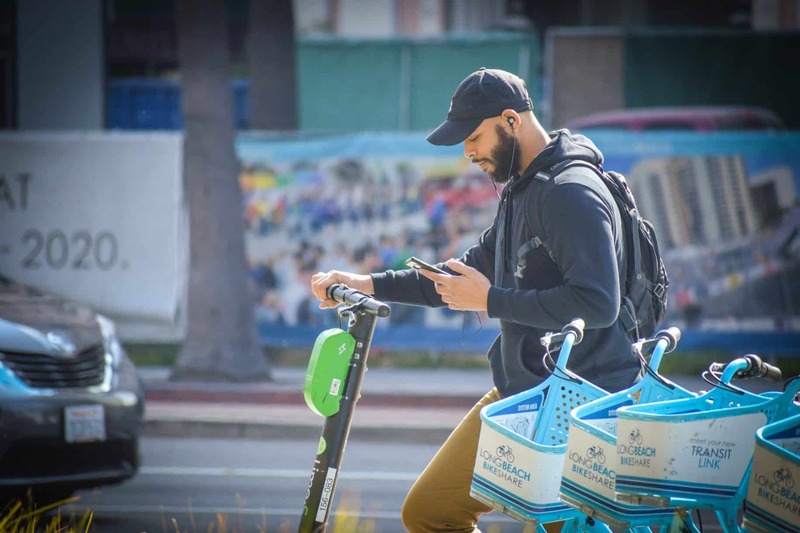 A rider uses his smartphone to unlock a Lime scooter in Downtown Long Beach. Photo by Brian Addison. It was an interesting factoid buried in a staff report attached to the Jan. 24 Metro Los Angeles Board Meeting agenda: The City of Santa Monica garners some $89,000 every month from e-scooter companies that operate in the beach city. That money is earmarked for capital improvements such as expanding sidewalks, creating green lanes, pedestrian improvements, and transit projects that “make walking, biking, scooter riding, and moving around Santa Monica easier and safer.” All that thanks to the $20,000 annual fee for e-scooter operators, the $130 annual fee for every e-scooter in the city, and the $1-per-day-per-device fee. In other words, Santa Monica benefits from a third-party transit option because it is regulating them after it had, like Long Beach, a pilot program. Long Beach’s e-scooter pilot program—a program I lauded because it was smart, at least initially—launched in July of last year and was supposed to only extend into October before Long Beach created a set of regulations. Then that got pushed to January. And now it’s been extended again, according to Michelle Mowery, the Mobility and Healthy Living Programs Officer at Public Works. With each month that we extend this pilot program, we lose out on tens of thousands of dollars that could go toward many things, particularly improvements in and revolving around our public spaces. (Maybe even planting a tree somewhere?) Let’s say we follow Santa Monica’s plan: With six operators and 1,000 scooters, Long Beach could garner roughly $52,000 a month or about $615,000 a year. Though the data on Long Beach specifically hasn’t been released by Bird, Lime, Spin and other national e-scooter operators, some have released data from other cities. Portland, for example, had nearly 650,000 trips logged within the first five months of its scooter program, with users spanning all socio-economic classes and over 60 percent of them being 40 years of age or younger. Charlotte had 100,273 trips in the month July 2018 alone. And Los Angeles has hired a private firm, Remix, to gather data from Lime and Bird to analyze how its city uses the scooters. Add onto that 40 percent of all car trips in the country are under two miles and the fact that most e-scooter trips are averaging under two miles and you not only have a viable form of transit but a way to cut carbon emissions—so let’s capitalize on it. Now.